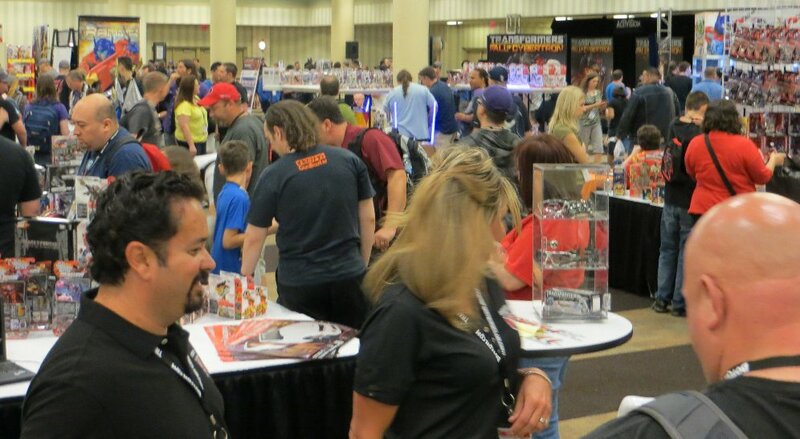 As usual, the most popular feature of the Convention... where all the toys and exhibits are located. 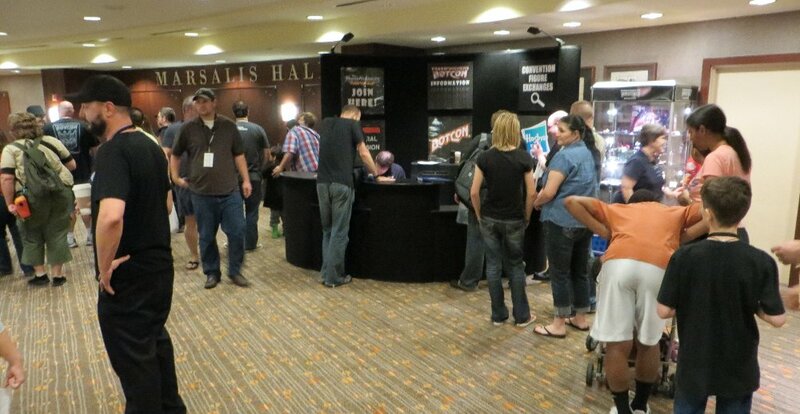 Outside, as the people were queued up waiting for the doors to open. 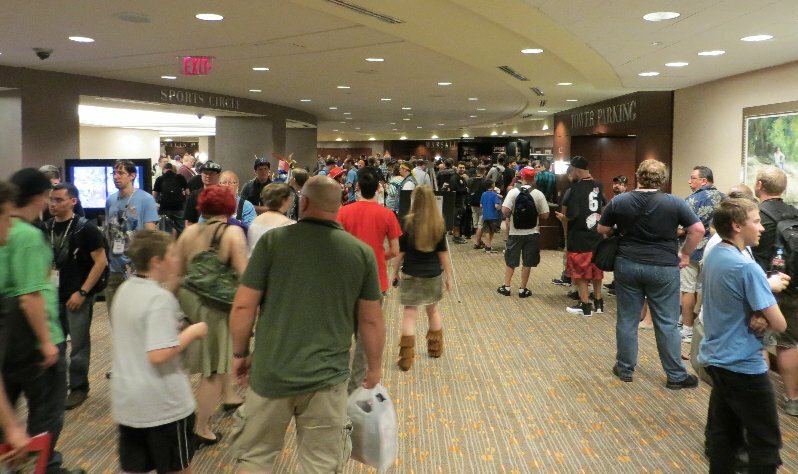 It wasn't a good venue for "waiting space", as these small, curved areas outside of the Dealer Room and Presentation Room, created a mess of people snaked around and made it easy for people to just push in. 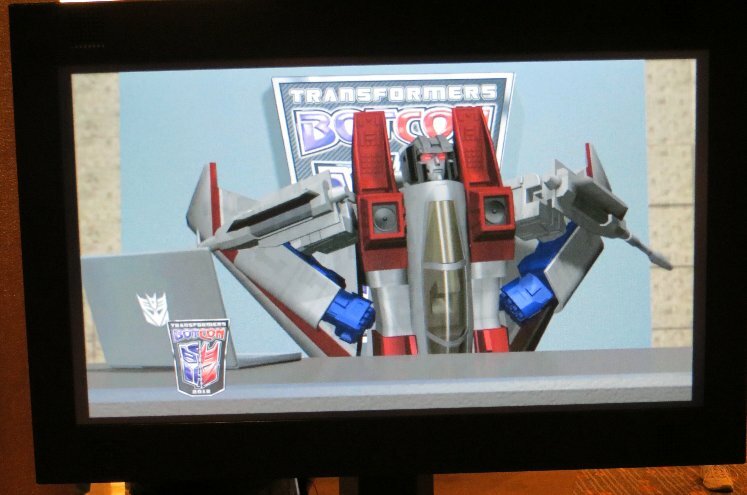 A couple of TV screens were on with various slides, schedules and the promo video for this year, featuring Starscream & Grimlock. 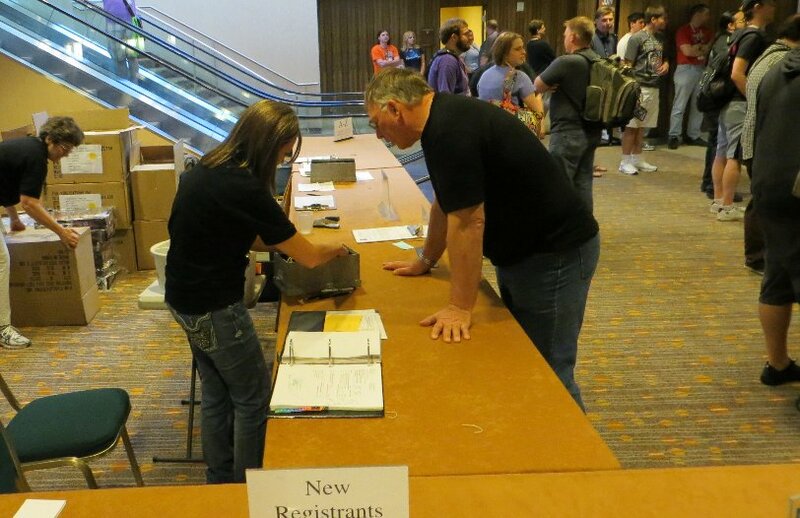 At the registration desk, official guests were showing up at this time, to register, ready for the evening's event. Garry Chalk arrived while I was there waiting for the Dealer Room to open. 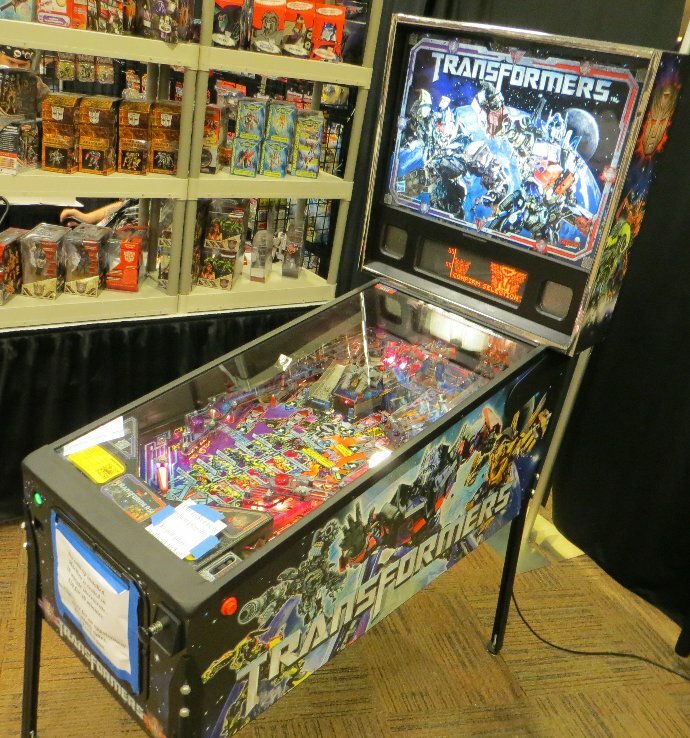 Some random photos taken throughout the Dealer Room. 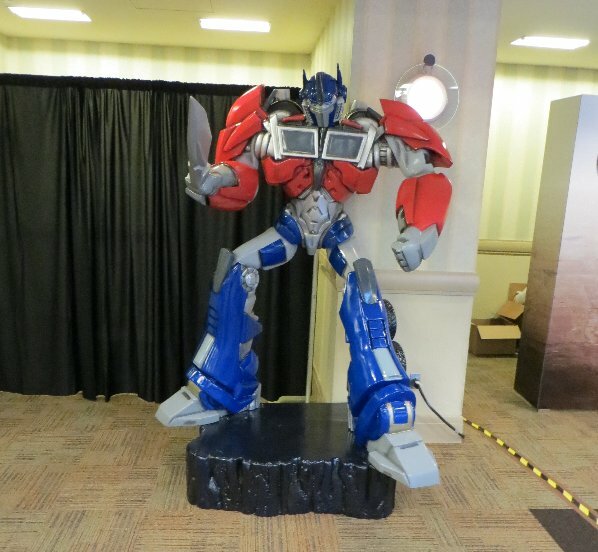 This was a dealer who had one of those giant Optimus Sound-speaker thingies that came out of Asia a couple years ago. Very huge, and very expensive. 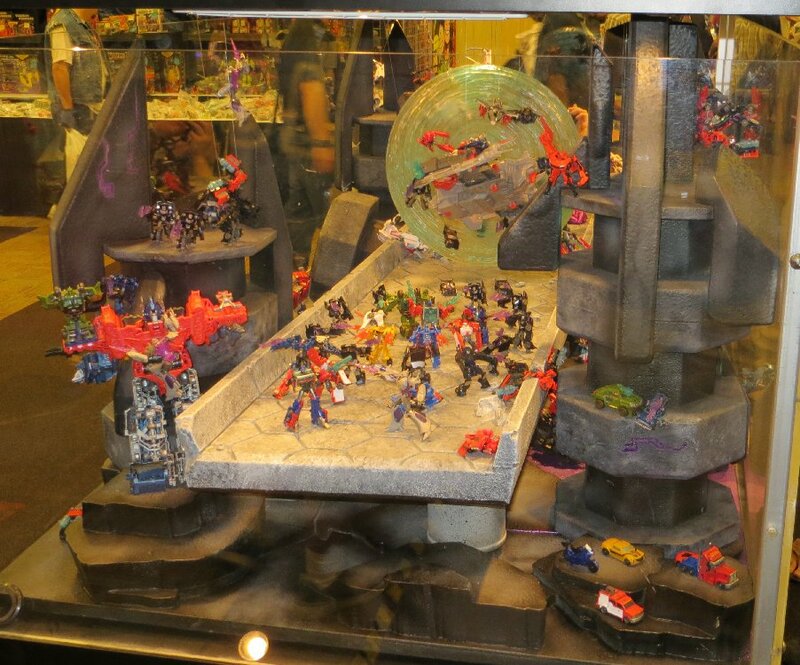 Next to it appears to be a store display for the Ultimate Optimus, which a couple dealers had. 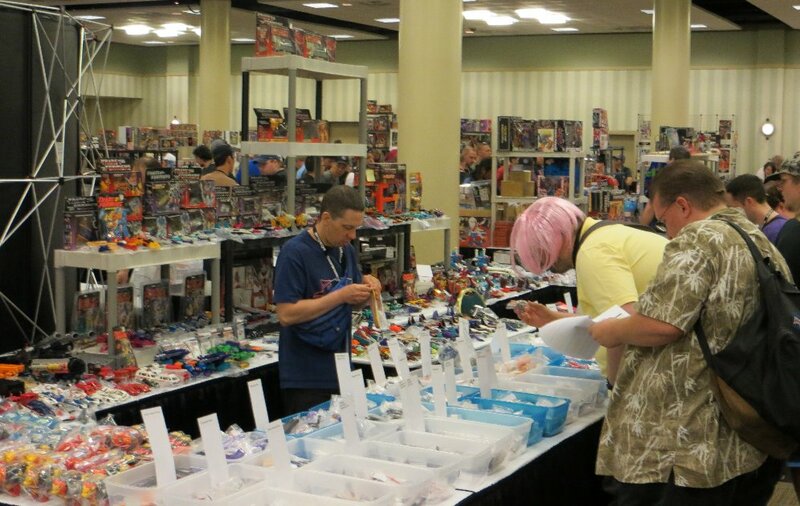 In the Dealer Room, the enforcement of no 3rd-party/KOs paid off quite well, as this year had the most filled & varied range of Transformers toys I've ever seen at a BotCon. 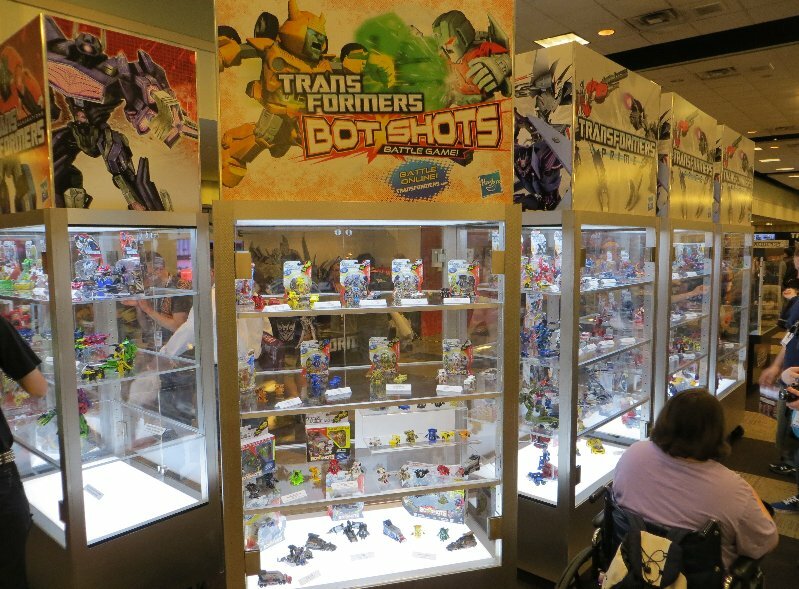 It was good to see tables full of Transformers toys without having to "scroll" through all the non-TFs stuff... kinda like scrolling through News pages of the Global Fansites when looking for actual TFs news. I couldn't believe the amount of stuff, and old stuff at that. 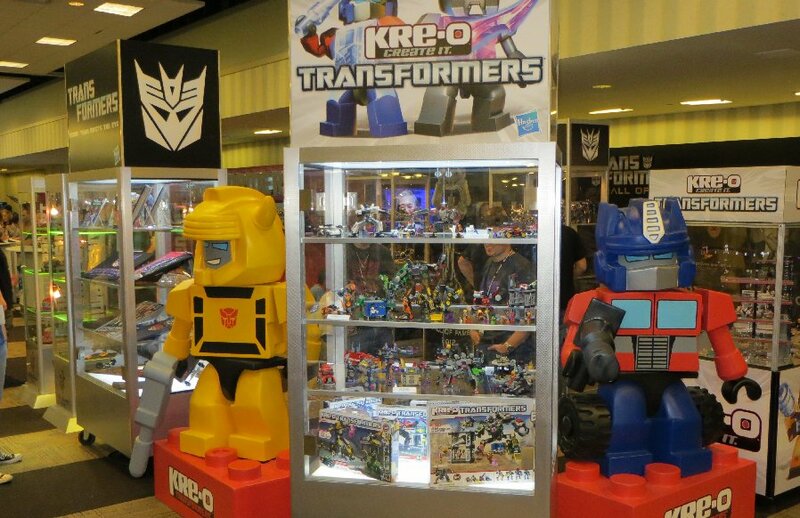 Most surprising is the lack of current Hasbro stuff. 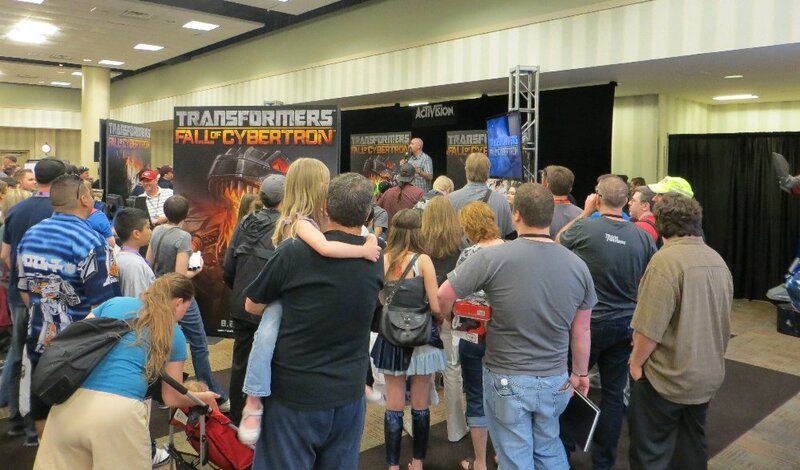 Very few dealers had TFPrime toys. 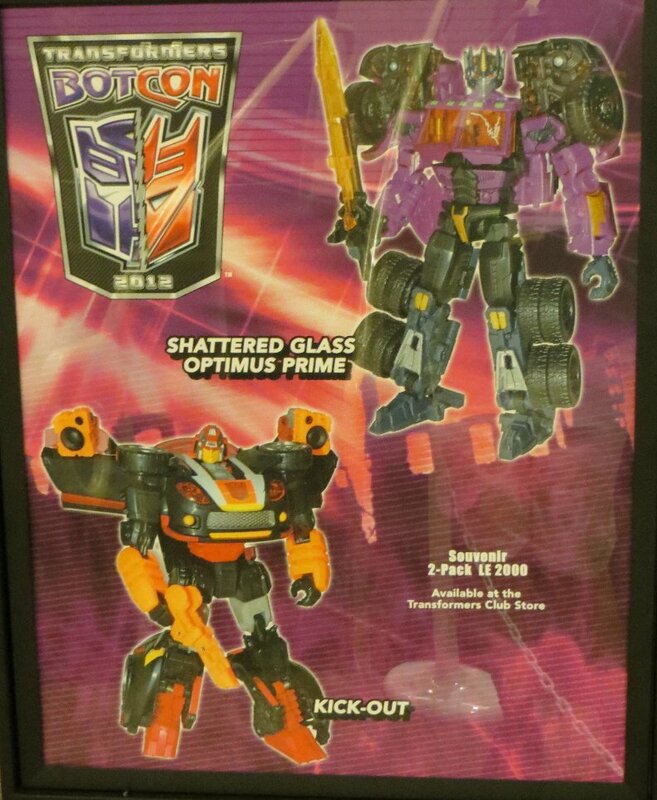 I think I saw more FE & JP TFPrime toys, than the regular Hasbro ones in stores here and America. 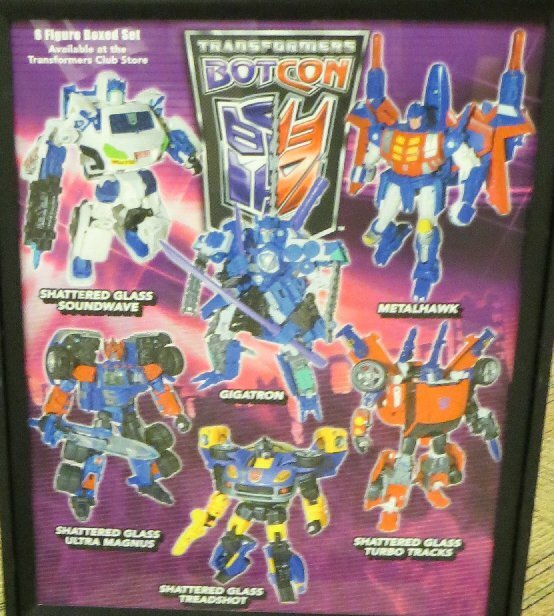 I only found two dealers with Wave 2 Deluxes (one had them for $30, the other for $20 - remember, US retail is about $13, so those were indeed scalper prices), and didn't find anyone with Wave 2 of any other size class. 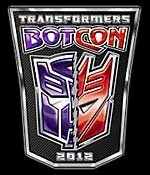 I think it is just a bad month to have a BotCon, as traditionally it is a quiet month/quarter for releases. 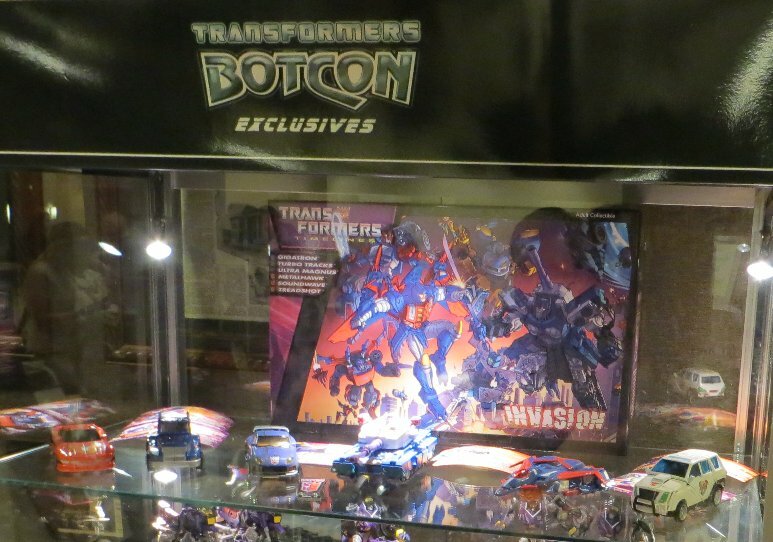 And then there were the official exhibits... starting off with everyone's favourite - Hasbro. 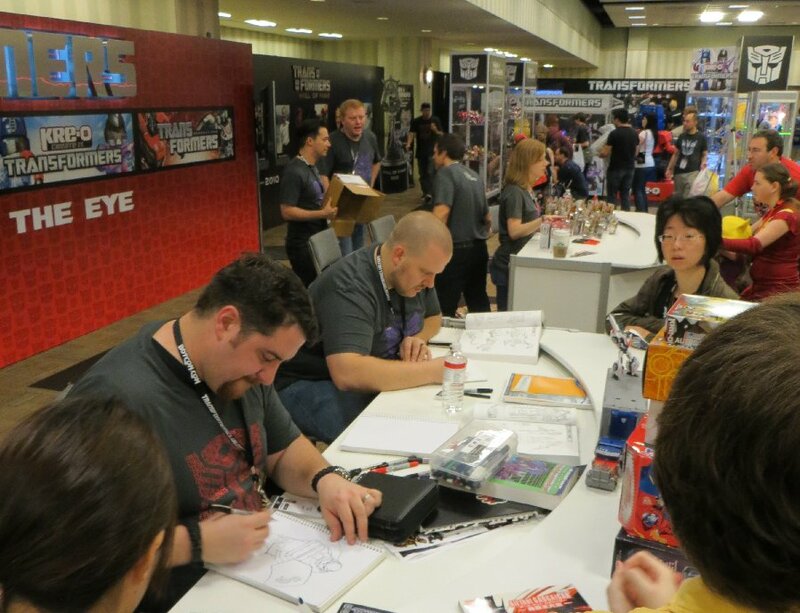 At the two tables, you could ask the Hasbro people questions (which I did), and have the designers draw characters by request. 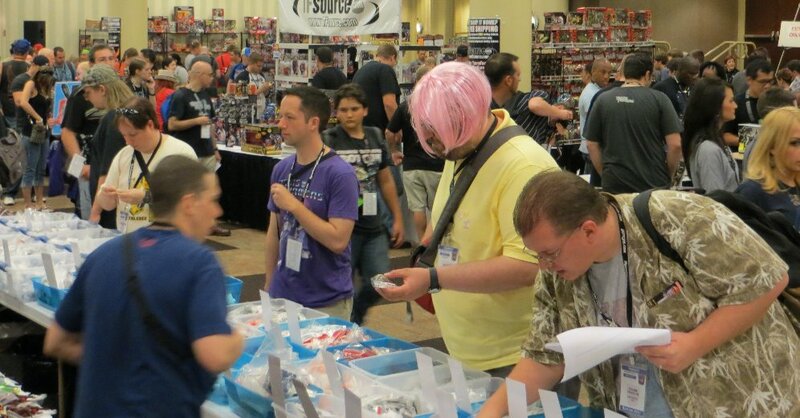 They were also giving out free toys this year. 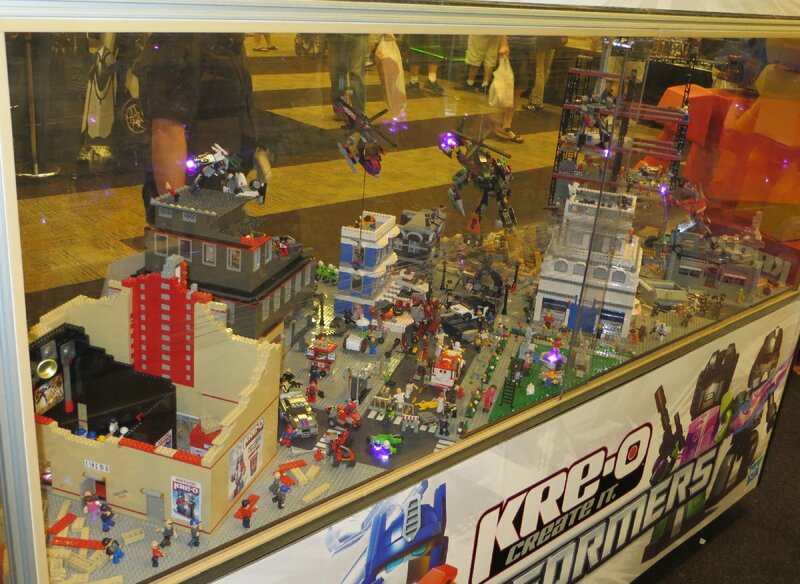 Kreo Mirage or Jazz, and first wave BotShots. 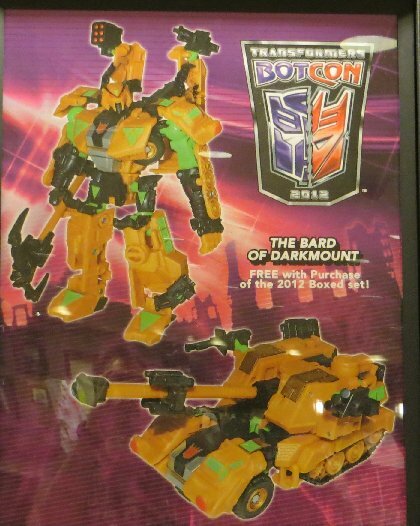 I didn't feel greedy enough to fight the crowd to get toys I already have, so on the Sunday when it was quiet, I got one of the last Kreo Jazz figures anyway. 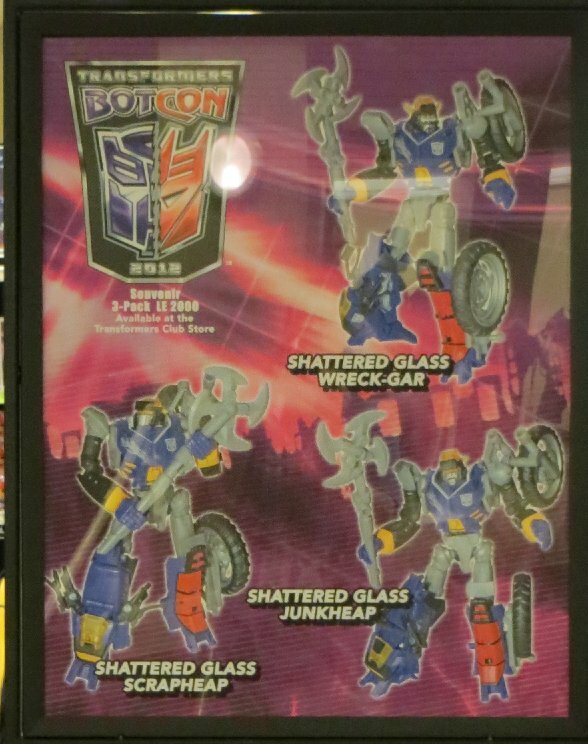 They were also giving out mini-posters for the upcoming TFPrime Nintendo game, and Rescue Bots mini-books (Volume 0 - which they were giving out last year). 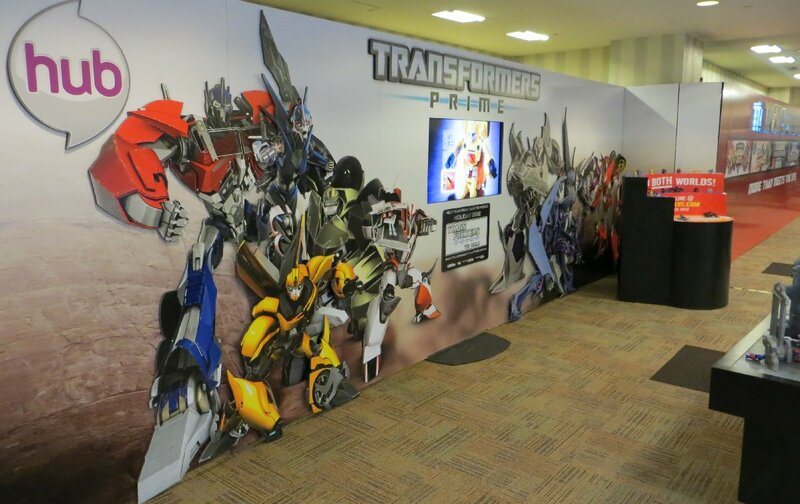 TFPrime Optimus for kids (and adult collectors) to have their photo taken with. 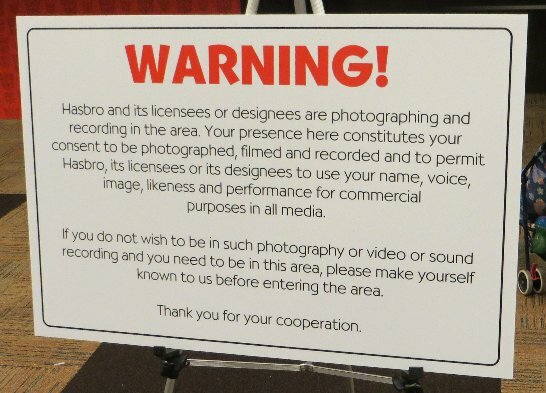 The usual warning in recent years. 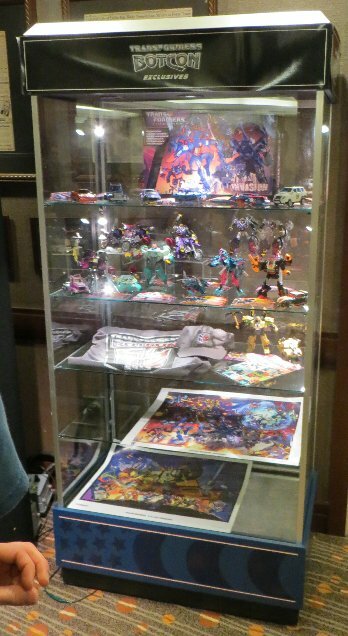 The actual toy display cabinets. It was disappointingly absent of anything new. 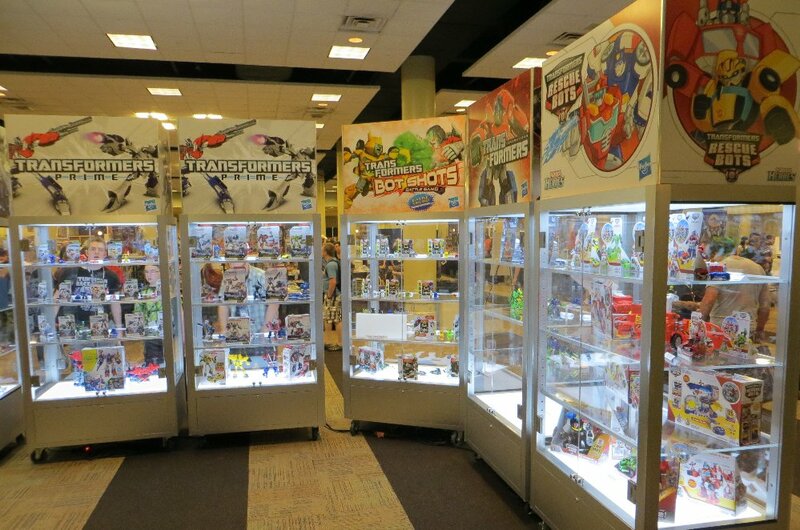 Actually, the only new items on the Friday were Rescue Bots!!! 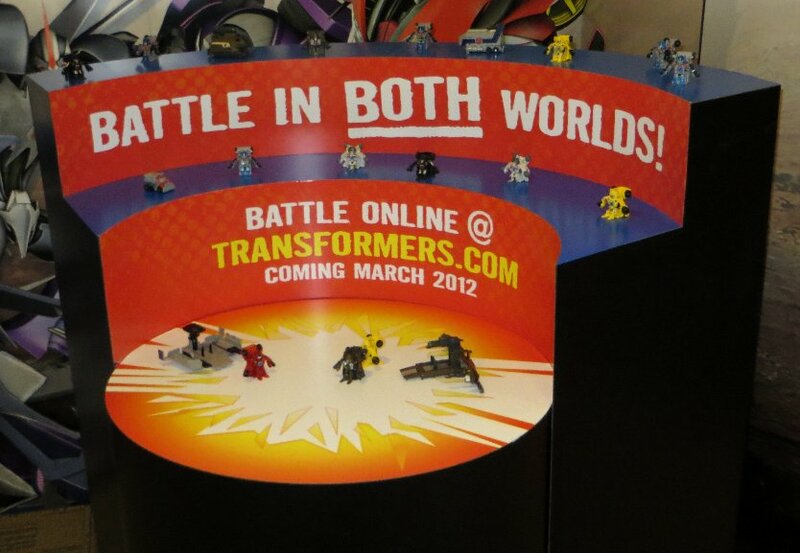 Everything else has been seen on fansites from various Toyfairs already. 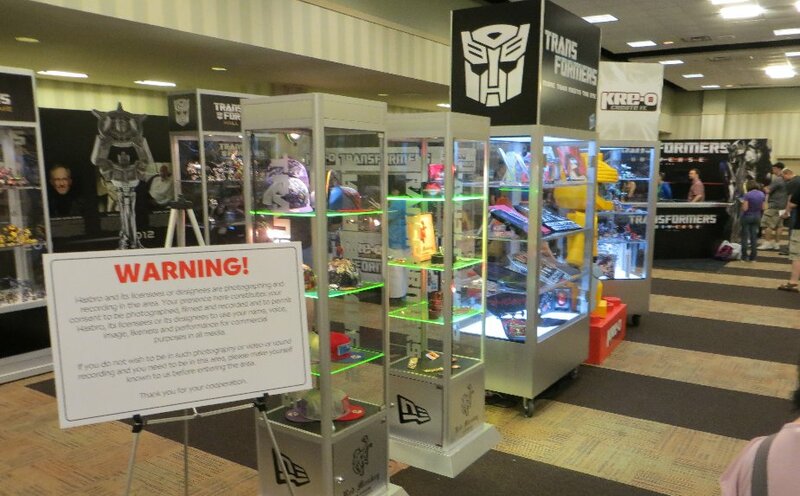 More were added on the Saturday, after the Hasbro panel... but even then, we only had a half-dozen previously unseen items added to the display. 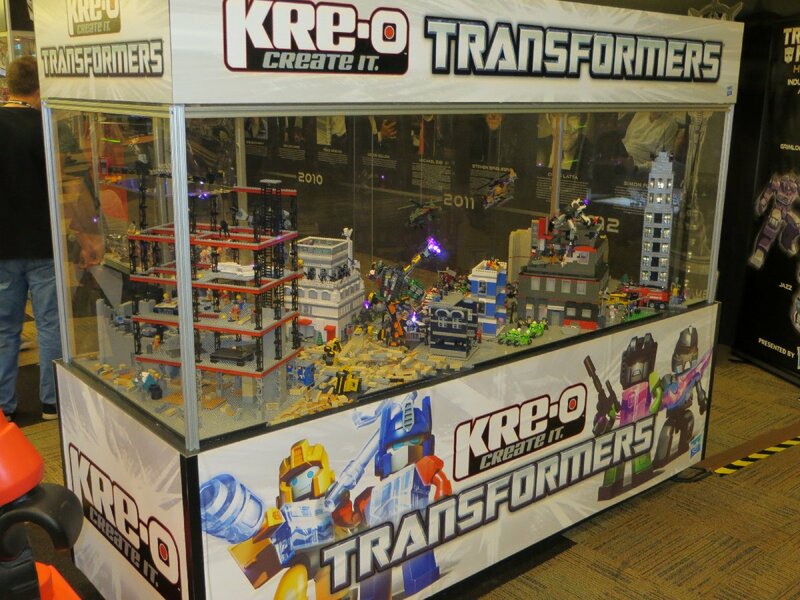 At the back corner of the Kreo & Merchandise cabinets was the Hall of Fame display, which can be seen here on the 2nd Hasbro Display page. People could sign up for pre-ordering the game. 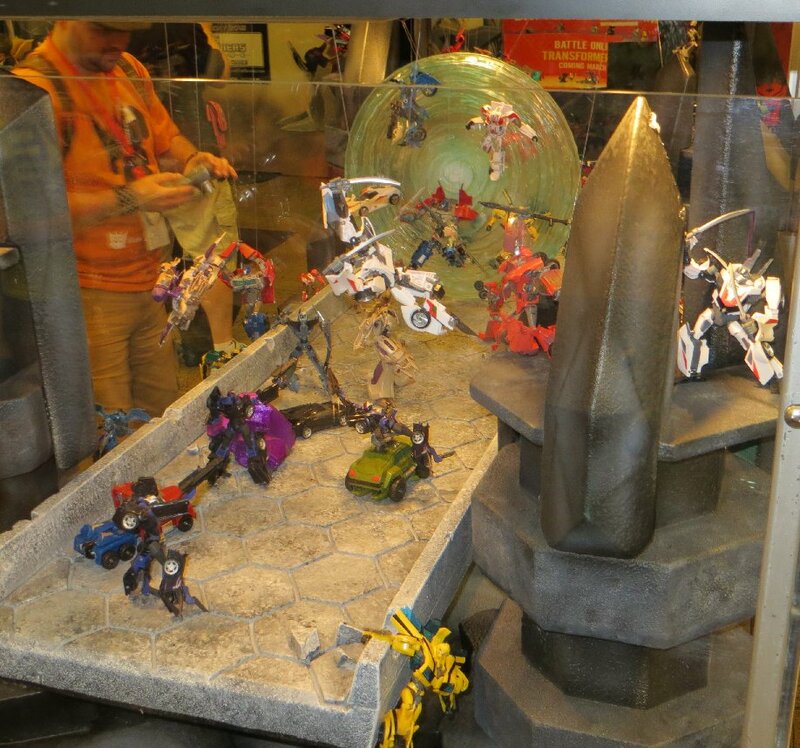 Every couple hours they would show off game-play of four characters - Vortex, Bruticus, Grimlock, Optimus. 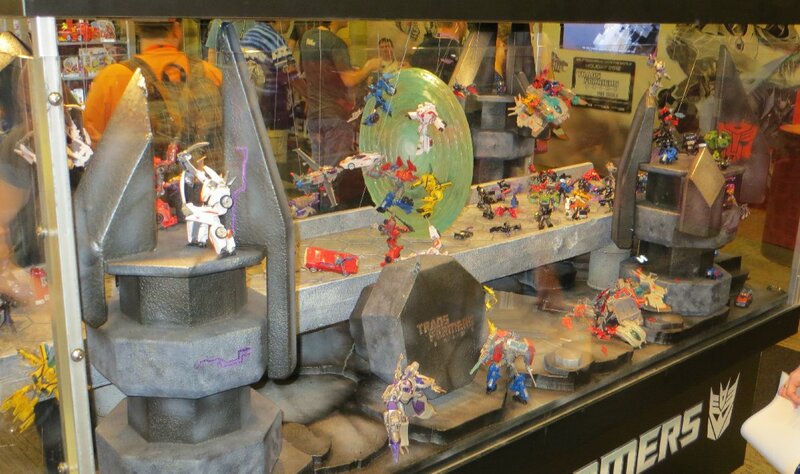 The game-play environment is HUGE. Looks like it will be a lot of fun. 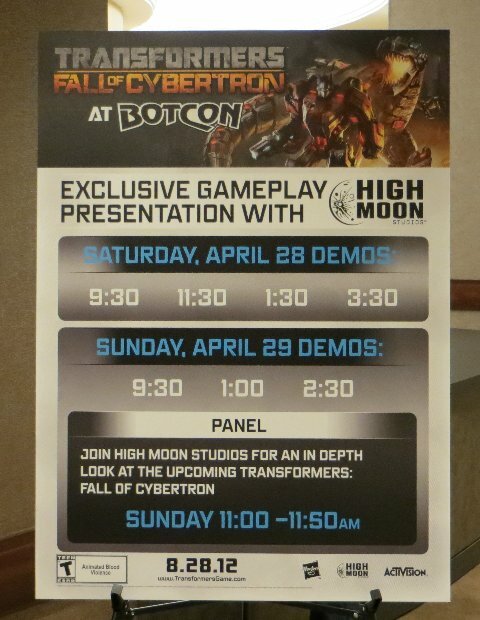 They said that they aren't allowed to say if FOC has an Escalation component (like WFC), but I was told that "the people at Highmoon love the Escalation format"... so read between the lines on that one. 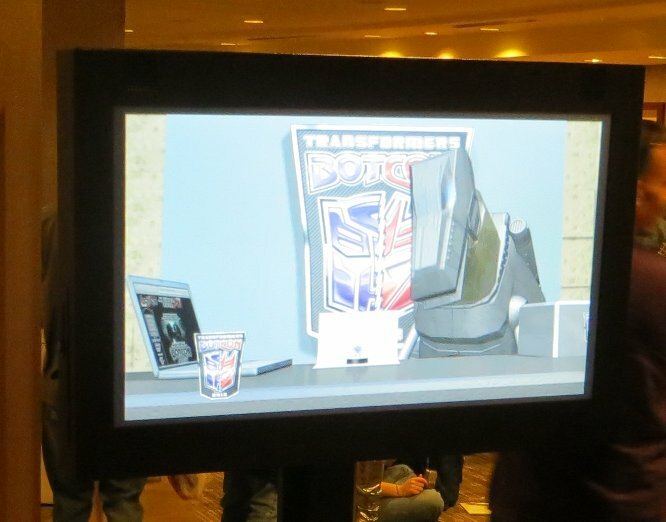 On the Sunday, they demonstrated a new level in the game - Starscream confronting Shockwave in his lab (with Grimlock breaking free). 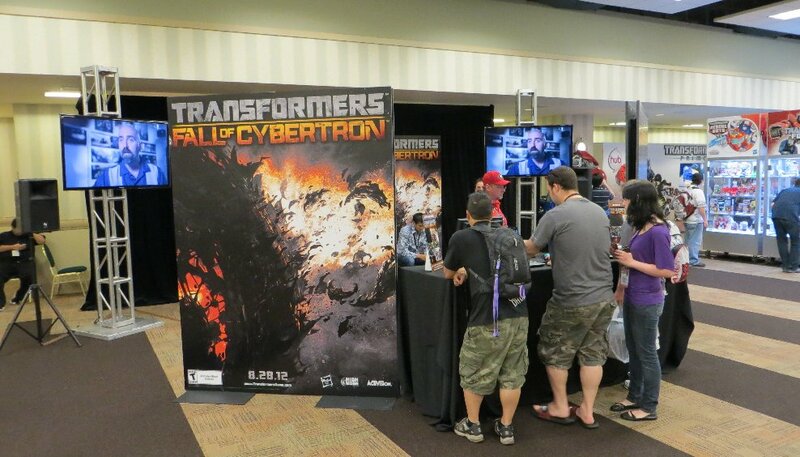 They also mentioned that in June/July, at some big Computer Game convention, they plan to be showing off the Metroplex portion of the FOC game. Something to look forward to. 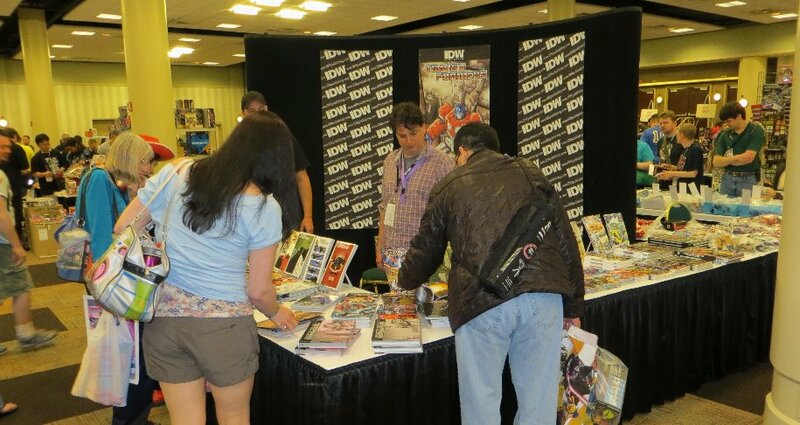 IDW's booth, selling comics and answering questions. 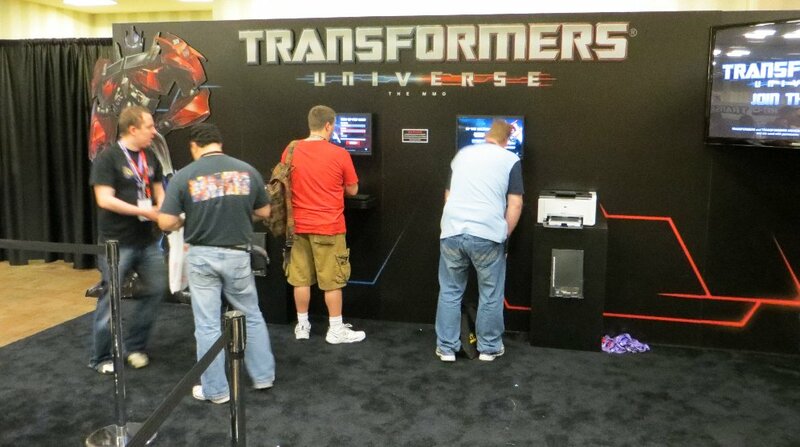 Jagex/Transformers Universe MMOG - They were allowing people to pre-register their usernames, getting in on good names or common names before the game is launched later this year. 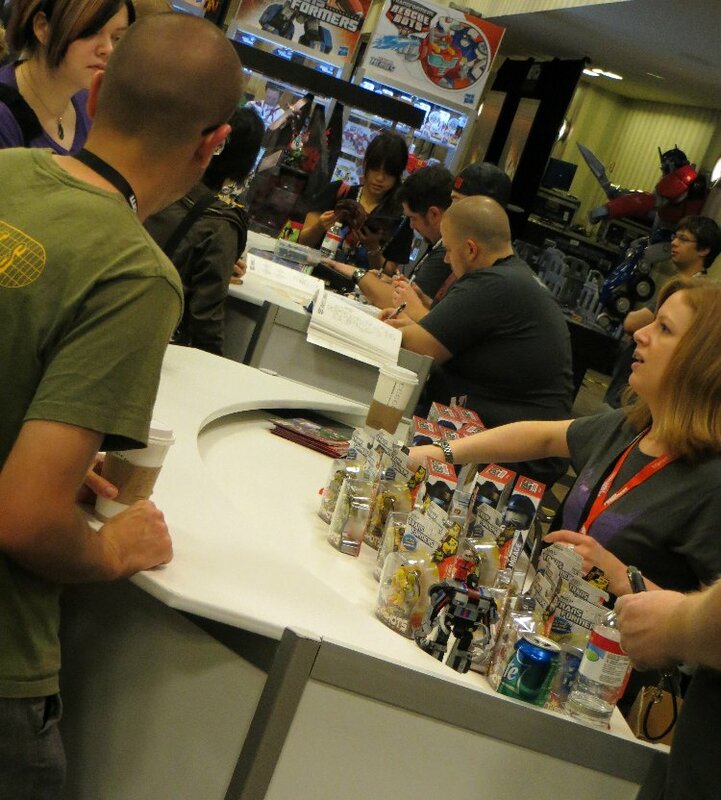 There were a number of artist tables throughout the Dealer Room, with several of them in this area next to the Autograph queue and Art display. 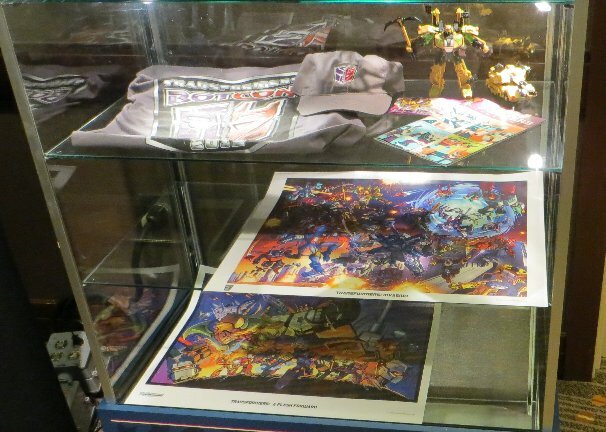 ART CONTEST DISPLAY - click the link to see the contest entries. It keeps getting smaller every year. One division only had 2 entries, which guaranteed prizes to each. I can't imagine it going for much longer if it keeps losing interest. 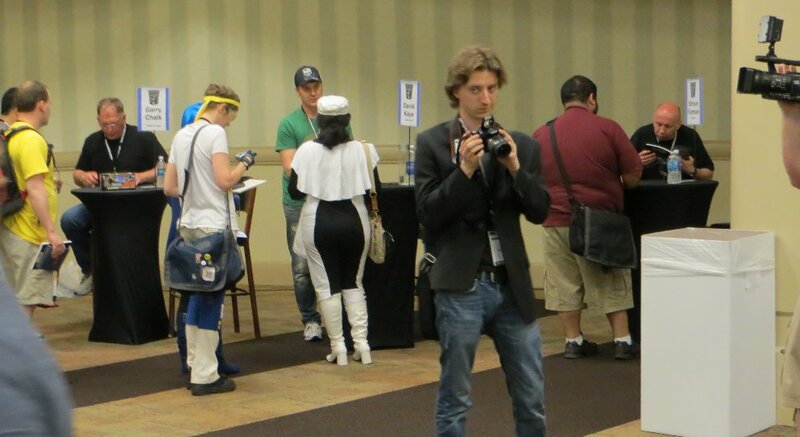 Generation One Voice Actors - Buster Jones (Blaster) & Dan Gilvezan (Bumblebee) (and Mrs Bumblebee sitting next tto him - she was actually wearing a t-shirt that said "Mrs Bumblebee"). 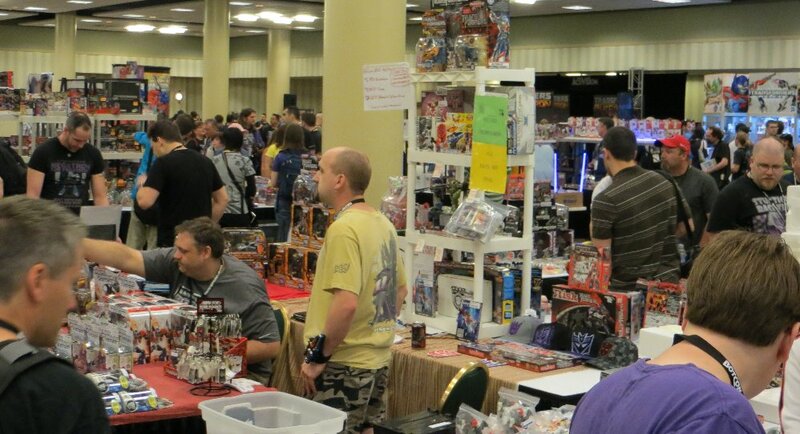 Garry Chalk, David Kaye & Simon Furman. Back at his desk, Simon Furman was selling copies of the unpublished Dreamwave scripts he wrote, and signing them as well. 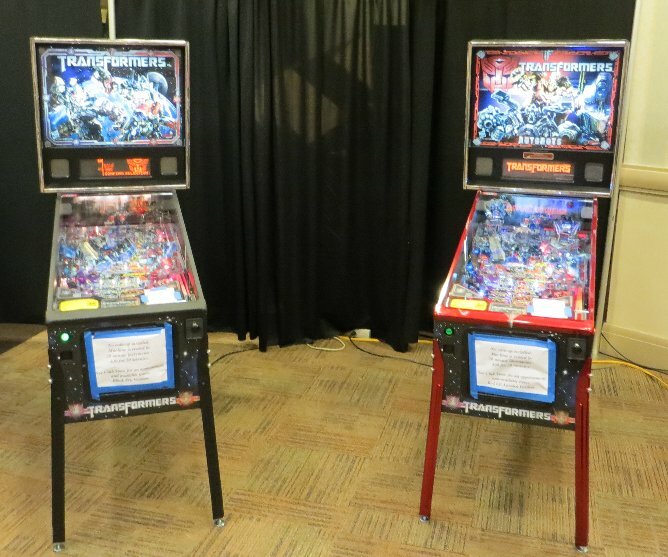 Official Pinball Machines - two were there, and they were signing up people to use them. Not sure if there was a fee, as I think it was to make sure that a crowd doesn't gather, fighting over who's next. 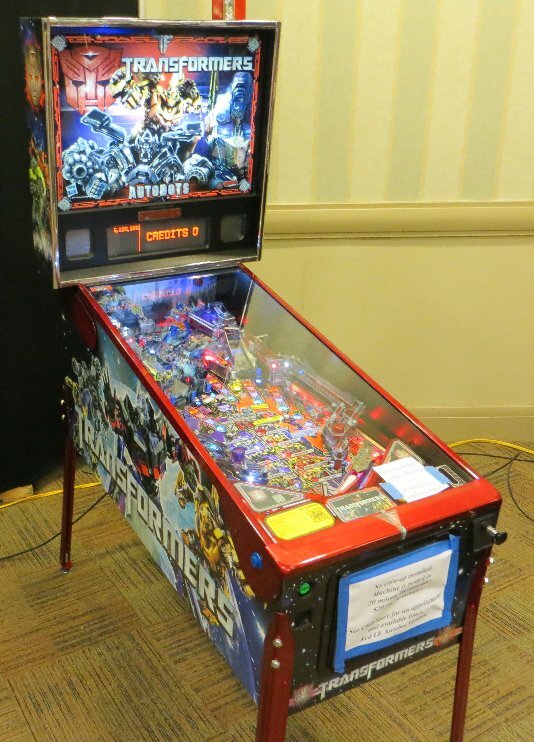 At the end of the Saturday, when no one was on them, I had a quick play. 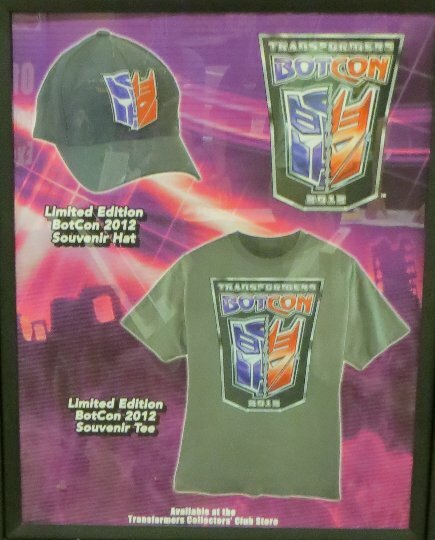 Near the club store, were some banners of the exclusive toys & merchandise this year. 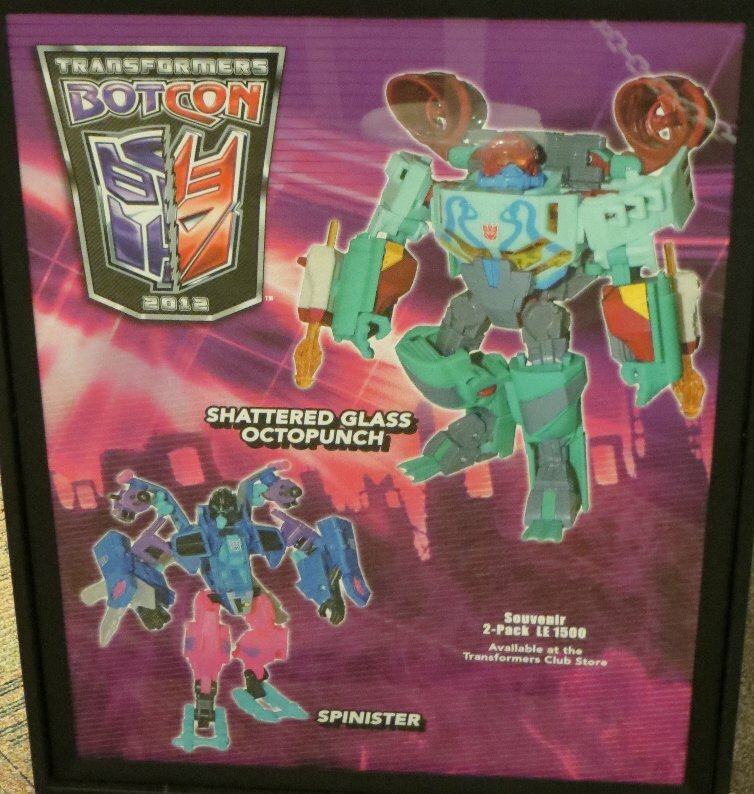 This was also outside the Dealer Room, the info booth (where you could get replacement parts for any BotCon toys or Drift) & display case. If you were following this day-by-day, click here to return to Friday.